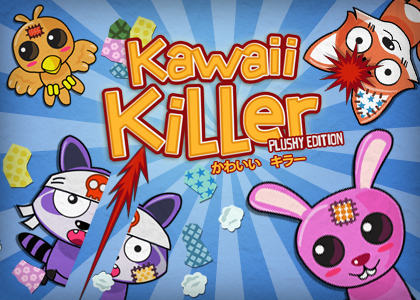 « Kawaii Killer revient sur l’AppStore le 2 Octobre ! Kawaii Killer Plushy Edition will be out soon! This is the soft version of our original game, Kawaii Killer. We created this version because Apple removed it from the AppStore 5 days after its first release. In Kawaii Killer Plushy Edition, the animals have been replaced by evil plushies, and you have to destroy all of them to save the Kawaii Forest! The gameplay didn’t change, plushies will come out of the trees and bushes, and you have to destroy each one of them, knowing that they are all differents and need a specific way to be eliminated. When the fox needs only a simple tap to be neutralized, you’ll have to perform a slice to destroy a rabbit, while the frog needs to be torn apart using two fingers! Because there are 14 different plushies, you’ll need memory and reflexes to survive their diabolic assault. One of the specificities of Kawaii Killer is that achievements unlock badges (there are 50 to unlock) which can be equipped to change the Arcade mode rules. It can be useful when you try to beat harder difficulties or want to go up the leaderboards. There’s also 36 challenges to beat. These are short and difficult levels, with special rules that can totally change the game. And for the most courageous, the Speedrun mode will require all your skills to beat it in a proper time. The game will be out on October the 2nd, on iOS and Android, so stay tuned! The “gore” version of Kawaii Killer is still available on Android, along with its demo.